NO SPAM OR VIRUS E-MAIL ORIGINATES FROM THE KERMIT PROJECT. If you receive junk mail from a Kermit Project address or member, it is forged. For more on this topic, CLICK HERE. The Columbia University Kermit Project website and software archive are frozen effective 1 October 2011, but remain available as a public resource. A new Kermit Project website has been established outside of Columbia at www.kermitproject.org for the continued development of C-Kermit, E-Kermit, and Kermit 95. See the announcement here. Kermit software and documentation remain available at the Kermit website and ftp archive, as always, but with changes described here. C-Kermit and E-Kermit have been published with an Open Source license and the source code for Kermit 95 (except for portions to which Columbia does not have publication rights) have been too. Kermit 95 executables and install packages will not be distributed in a free and open manner because they include strong encryption, whose export is controlled by the United States Government. For Kermit customers who cannot use open source licenses, and would like to continue to purchase copies of the software as they have previously done, please contact techventures@columbia.edu and mention Kermit in the subject line. Technical support is no longer available from Columbia University effective July 1, 2011. The pages of the Kermit website have been updated to reflect the new support and licensing status of the Kermit software. See the Transition Roadmap (button just below) for the latest and most accurate information. All Kermit software programs are built around the Kermit File-Transfer Protocol designed at Columbia in 1981 and refined and extended over the years, which allows two software programs on each end of a communication connection to transfer both text and binary files correctly and completely [Read more...] In addition, many Kermit programs also make connections over various communication media and act as a terminal. And in many cases they also include a built-in programming language to allow any communication procedure, any dialog, and any file-transfer or -management task to be fully automated. Since 1995. Supports all 32-bit versions of Microsoft Windows as well as OS/2 Warp. Runs on 64-bit Windows versions in 32-bit mode. Emulates over 40 different terminals including VT100, VT220, VT320, ANSI, HP, IBM, Linux Console, Sun Console, QNX, AT386, SCO ANSI, SNI 97801, Televideo, Wyse, and many others. Also supports XYZMODEM file transfer and SSH security in addition to Kerberos and SSL/TLS. As of 30 March 2011 the K95 manual is available online and as of 20 July 2011, the source code is too. Since 1985. Supports hundreds of 32-bit and 64-bit Unix varieties (Linux, Mac OS X, Solaris, AIX, HP-UX, FreeBSD, NetBSD, SCO, many others) as well as VMS on VAX, Alpha, and IA64. Older versions available for 16-bit Unix versions as well as for other operating systems including Stratus VOS, OS-9, AOS/VS, Atari ST, Commodore Amiga, and Apple Macintosh. The Unix version can make ssh connections using the external Unix SSH client, and has optional built-in support for SSL/TLS and Kerberos security. 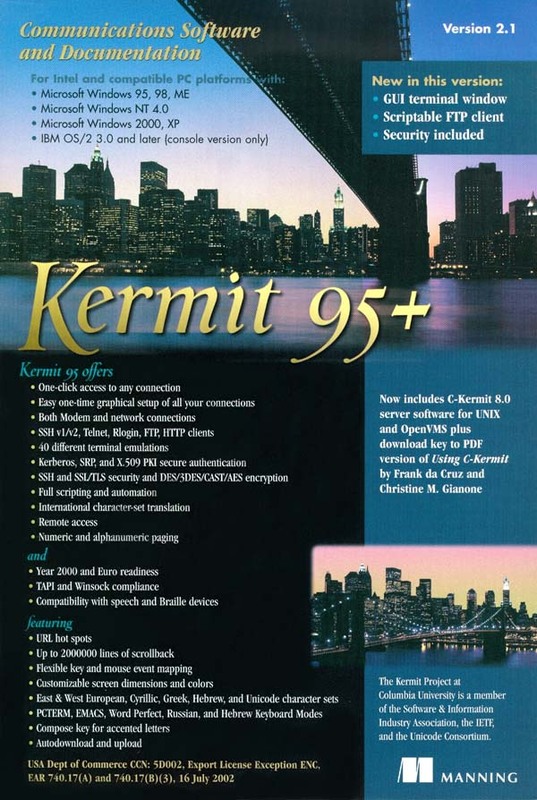 C-Kermit is also the basis for Kermit 95. MS-DOS, PC-DOS, Windows 3.x Since 1982. For DOS 2.0 or later and 16-bit Microsoft Windows versions through 3.11. Includes built-in TCP/IP stack. Emulates 15 terminals, including DEC VT100, 220, 320; Data General DASHER, Wyse50, ANSI text terminals as well as Tektronix and DG color graphics. Does not include encryption, TCP/IP supports Telnet only. Fits on a single diskette. Not for 32-bit or 64-bit Windows. 1.00 Unix Since 1999. Simple and fast Kermit protocol implementation written to satisfy the demand for a GPL Kermit file-transfer program for Unix. File transfer only, remote end only; no making connections, no terminal emulation, no scripting, no character-set conversion. (Any) Since 2004. Super-compact and efficient Kermit protocol code for embedding. File transfer only, no security, no making connections, no terminal emulation, no scripting, no character-set conversion. This is not a complete communication application, just a "subroutine" that executes the Kermit file transfer protocol suitable for embedding in other programs or in chips or devices. Source code now available. VM/CMS, MVS/TSO, OS/390, CICS, MUSIC Since 1982. Kermit file transfer for IBM mainframe operating systems. Far end only, no making connections, no terminal emulation. Extensive character-set conversion capabilities supporting many Country Encoded EBCDIC code pages. And all the others... MULTICS, DTSS, NOS, GCOS, MUMPS, RT-11, Cray, RSX-11, TOPS-10, TOPS-20, OS/8, MPE, CP/M-80, CP/M-86, iRMX-86, ISIS, PICK, UCSD p-System, Flex, IDRIS, Xelos, TISP, PRIMOS, Sperry VS9, Nonstop, TRSDOS, Soviet mainframes, ..... About 180 Kermit programs spanning 30 years in 36 different programming languages. As of 18 August 2011, every Kermit program ever written by or submitted to the Kermit Project is archived and cataloged HERE. kermit.html What is Kermit? Overview.